A Series Search is useful if you do not know the plat citation (such as the plat number of the plat book and page number). 1. To perform a Series Search, first navigate to an individual county page by clicking on a county in the drop down list titled, SELECT COUNTY from the home page. 2. 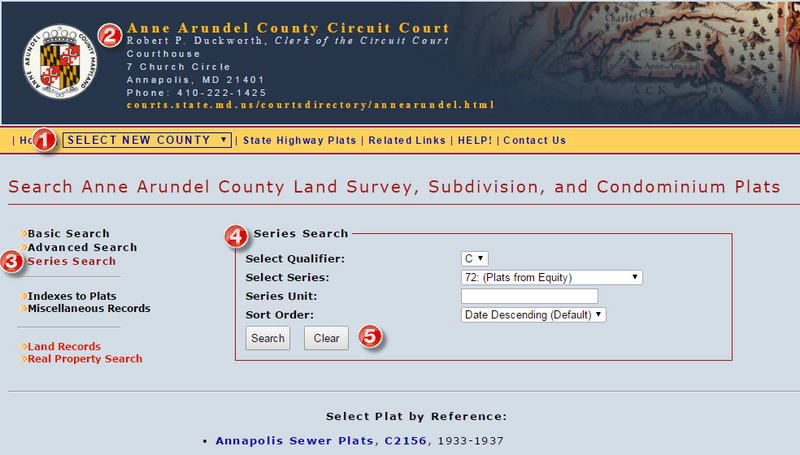 At the top of a given county's web page is the name of the county, name of the current Clerk of the Court, address and phone number of the Circuit Court for that county, and the web address for the court. 3. By default the Basic Search option will be available when first accessing the main page for a specific county. Click the Series Search option located on the left side of the screen. Qualifier: Determines selection of a county (C) or state (S) record series and filters the series displayed in the Series selection list. Series: Provides the series number and series name to identify the record series you want to search. Series Unit: Enter a specific item number that you want to search for in a given record series. Note: If no series unit is entered, then the system will list all items in a record series when searched.